One of cycling’s top Eastern events, this race attracts over 600 competitive cyclists annually from across the country for three days of racing one of New England’s most challenging courses. The Town of Killington will host the second annual skateboard and streetluge on East Mountain Road June 6 – 8, 2015. Riders from all over the world will gather at Killington to ride 2 miles of the fastest course east of the Mississippi. Reaching speeds of over 60 mph, gravity lovers have a new reason to visit Killington in the summer. Come watch 144 of the best junior golfers in the world challenge “Vermont’s Favorite Golf Course” Green Mountain National! The AJGA is a non-profit organization that helps young golfers receive college scholarships. AJGA Alumni include Tiger Woods, Phil Mickelson, Paula Creamer & many more. See golf’s next generation today! Benefitting Vermont Adaptive, this ride offers a course for every ability level, as riders may choose the 100-mile loop, 50-mile loop, or 20 mile loop. All courses start and finish together at Long Trail Brewery, located on Route 4. Post-ride festivities at the Brewery include a BBQ, live music and family entertainment, refreshments, and more. The Killington Fire Department and the Killington Parks and Recreation Department hosts an all-day 4th of July party and fundraiser, featuring a parade, live entertainment, family activities, a BBQ, pool party, and fireworks on the River Road recreation fields. Mountain bikers will gather at Killington Resort for the Downhill and Enduro USAC Regional Championships on July 4th & 5th, 2015. The Eastern States Cup is officially sanctioned by USA Cycling for Mountain Biking. The camps are offered in conjunction with Killington Resort, and participants will have the opportunity to utilize Killington’s amazing summer opportunities, including their brand-new, exciting 2015 offerings like the High Ropes Course, the Soaring Eagle Zipline, and the Amazen Maze. In addition, campers will have access to the resort’s state of the art mountain biking terrain. Head to the Sherburne Memorial Library Thursday evenings for this summer concert series. Bring lawn chairs, blankets and snacks to relax, while enjoying a variety of free musical entertainment. Dirty Girl Mud Run is an obstacle course run for women of all ages and athletic abilities. Don’t worry it’s not a “race” in the traditional sense. It’s an untimed 5k mud run designed to push you slightly out of your comfort zone, but only as far as you want to go. Forming teams is encouraged, and so is helping your fellow Dirty Girls to the finish with some mud, sweat and cheers. At a Dirty Girl Mud Run you’ll find excitement, laughter and camaraderie as well as lots of music and even some adult beverages. It’s a mud-covered day you’ll never forget. Green Mountain National is proud to host the Vermont State Women’s’ Golf Associations’ Senior Championship. Whether you’re a seasoned Jamboree veteran or interested in attending your first one, the Killington Jeep Jamboree is an event you will not want to miss. The Killington Grand Resort Hotel and Spa will serve as event headquarters and offer a relaxing and comfortable way to unwind after a full day of outdoor exploration and adventure. The Killington Wine Festival continues to bring hundreds of fine wines from around the world to Killington in summer. Events include the Estate Tasting at the Peak Lodge, the Grand Tasting and Wine and Nine Golf Scramble. 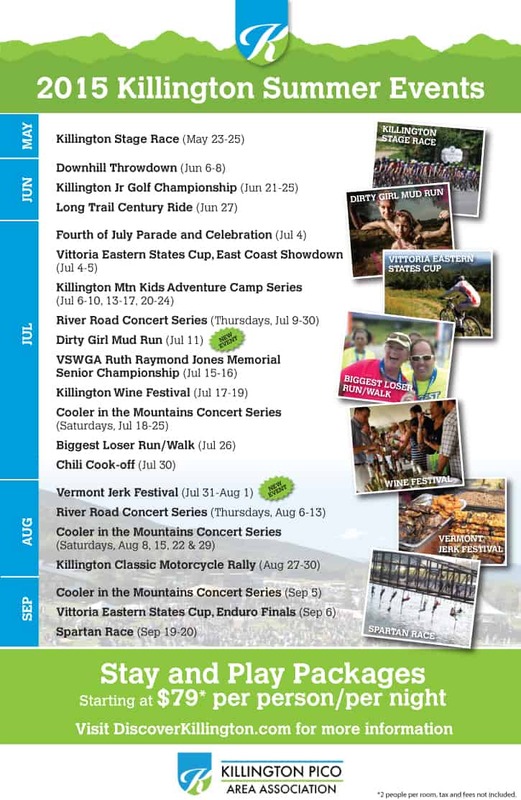 The Killington Wine Festival is produced by the Killington Pico Area Association. The Cooler in the Mountains Concert Series returns to Killington’s Roaring Brook Umbrella Bars at the K1 Base Lodge every Saturday beginning at 3:30 pm. The free concerts also include outdoor activities, a beer garden and BBQ. The event returns for the third year, providing participants a fun, healthy way to stay active in non- competitive environment. Killington Resort hosts the race, which includes a half marathon and 5k, as well as a 1-mile fun run for children. The event includes a health expo on Saturday and a post-race concert and celebration with Biggest Loser Contestants on Sunday. The 3rd Annual Chili Cook-Off is guaranteed to bring back the best tasting chili in town! Join the competition and bring your finest dish to compete for the title of Best Chili, or stop by the event to taste the chef’s creations. Killington welcomes Vermont’s first JerkFest, a celebration of Jamaican Jerk food and Caribbean culture with live reggae and world music, family friendly activities, steel bands, Chef demos, cocktail demos, Rum & Brew and more! The Classic is Vermont’s premier motorcycle event featuring some of the best touring in New England along the picturesque roads of Vermont. Presented by Americade, the rally returns to the Foundry Restaurant for the second year, featuring social events, a vendor village, stunt shows, live music, and a 12-mile parade of bikes. Mountain bikers will gather at Killington Resort for the Enduro Finals on September 6th, 2015. The Eastern States Cup is officially sanctioned by USA Cycling for Mountain Biking. Home of the 2014 Spartan World Championship, this course is brutal. Located in what is known as ‘Joe’s backyard’, this land is where the company was founded; that means anything goes. Steep slopes. Muddy waters. Huge hills. This epic setting makes for one of our most badass, challenging, demon-riddled Beasts of the year. We’re looking for the baddest beasts of the east to come tear up the terrains where Spartan Race has its roots. Be forewarned though, the course is known to destroy the body, legs, mind and soul. Competitors can choose to race in the Ultra Beast: 26+ miles, the Beast: 12+ miles or the 3.5+ mile Sprint. Additionally, young Spartans are invited to race the Spartan Kids Races. Wet your whistle with a backdrop of 4,241′ of Vermont’s finest autumn foliage and enjoy live music, a plethora of fabulous food offerings and over 100 of the finest craft beers in the region. One of Killington’s most distinctive annual celebrations, the Brewfest gets bigger and bigger every year.